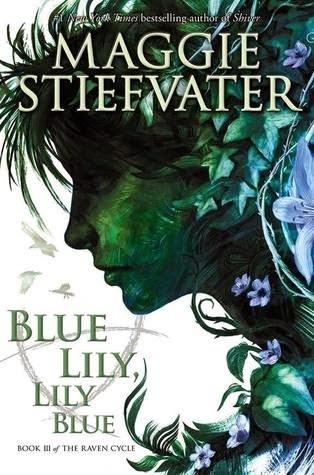 It is with great sadness and a heavy heart that I tell you that Maggie Stiefvater's Blue Lily, Lily Blue, book three in the Raven Cycle, is a major disappointment. Let's start with what bothered me the most: there's barely any meaningful Blue and Gansey interaction. There's two moments of secret touching. The rest is the two of them making “forbidden” midnight phone calls to each other, and their conversations are completely boring, pointless, and actually pretty pretentious. They create some little running inside joke about Congress. I think it was an attempt to show how oh-so-clever and perfectly suited Blue and Gansey are to each other, but it was just plain annoying. Another thing. I thought I was supposed to be afraid of Greenmantle. All the other characters in the book are shaking in their boots at the mention of his name. But he turns out to be the damn comic relief. He was easily defeated by two teenage boys who have no real means or experience to take him on. Then, when he faced some real-life danger at the cave, he bolted like a little coward. Why was he hyped up so much? Greenmantle's wife Piper becomes the new villain. So I guess it's a shame that I like her so much. With the way her character is written, it's unclear whether I am supposed to or not...? She has more guts and guile than her nefarious craven husband. First and foremost: there's not nearly enough Ronan. I guess I was spoiled by the last book revolving around him and his storyline. This book really would have benefited from more Ronan. Adam finally finds his nerve and swallows his pride (sortof). But I stopped caring about him, so it doesn't matter. Am I supposed to be sad that Persephone dies? There wasn't enough of her to form any emotional attachment. How many times does it need to be mentioned that Blue eats yogurt? How many times does the phrase, “Do you really know a person?” or some form of it, need to be used? I think it's used at the end of every single chapter where each character wonders about truly knowing the other or not. The overarching plot, the search for Glendower, hasn't really progressed. This book is like a detour; it focuses on all of these little side-missions that completely detract from the original storyline. I feel like if this book didn't exist, it probably wouldn't even affect the series. The book's only saving grace is that Stiefvater has a gift for writing beautifully constructed sentences. Will I read the next book(s?) in the series? Yes. I'm in too deep now. There's no turning back at this point. I have to see this series through. Have you read Blue Lily, Lily Blue? To my surprise, it's getting a lot of rave reviews. Are you a fan? Isn't that the truth? But Maggie Stiefvater has really made a name for herself in the YA world, so I guess it is to be expected. I checked out your post as well. :) I love your blog's name! I love The Raven Boys series because it's different from any other book I have read and I really like Maggie Stiefvater books!! I found myself also wanting more Ronan. I am a fan of Maggie and did like the ending of this book and hope the fourth is good.